Shulchan Aruch 32:15: If the left foot of the hai is perforated, even if לא נשאר ממנו אלא כלשהו it is kosher according to Rosh. Rema remarks: but the other poskim require כמלא אות קטנה (a full complete small letter), and Rema concludes that the halacha follows the latter opinion. [note the MB 32:40 remark: this is not a chumra but the hard-line halacha, וצריך להזהיר מאד הסופרים שנכשלין בזה]. One might think that SA and Rosh hold that כלשהו means any tiny dot visible to eye, is sufficient for this hai to be kosher. This is obviously a mistake, the common sense [and R. Vozner paskens so, Sheivet Halevi vol. 2, Yore Dea Siman 140) that the כלשהו mentioned is a size worthy to be considered the inner foot of a hai, not any tiny dot. This interpretation is very important, we use it l'halacha l'mayse when a tiny drop of ink falls into a Dalet or Reish – although we (ashkenazim) follow the Rema's psak given above [machmir in regard to mloi ois ktana], but to be maikel against the SA and Rosh and machshir the dalet or reish because there isn't a shiyur for the inner foot according Rema, is out of the question. Pashut that since even at half the shiyur of a kulmus a well placed dot in a dalet is definitly a Hai (even if not a kosher one) it is pasul for a dalet, and scraping the dot is chok tochos. But what if there is a tiny dot כלשהו inside the dalet, if according SA and Rosh this would be a kosher hai, although the tinok would read it a dalet, we would machmir and say it is pasul?? 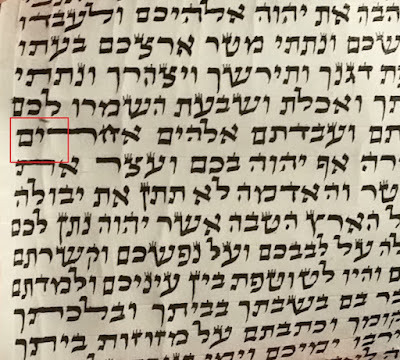 Now, since even according to SA and Rosh כלשהו has some measure, therefore this tiny dot inside of a dalet or reish doesn’t automaticly pasel, but is a shaylas tinok. If so, what is the argument between SA and Rema [from here on I will use these names in general for each shita respective]? The SA holds that what decides a hei is not a dimension of shiyur (k'mloi ois ktana = 1 kulmus) but something else – the general recognition of the letter, if it is recognized as the correct letter [in our case a hai] that is enough. The Rema holds that recognition of the letter is not enough, there is also a required measure - (k'mloi ois ktana = 1 kulmus). This means although everybody recognizes the letter as a hei, we must measure the inner regel, if its lacking the shiyur it isnt kosher. To my humble opinion, the outcome of this argument and its details, influence more than any other halachic point in defining ksiva tama & tzuras ois. I truly think this is not an exaggeration at all. Even one would say that I exaggerated, after explaining bezras hashem some of the נפקא מינה of their argument, will at least admit that it is a most basic element in ksiva tama & tzuras ois. The argument mentioned is not only in regard to the left foot of the hai, but also to the right foot as well, although all agree that the minimum measure of kmloi ois ktana is required for the right foot, they may disagree to the explanation of what kmloi ois ktana means. In the BY 2 interpretations for "kmloi ois ktana" are mentioned. 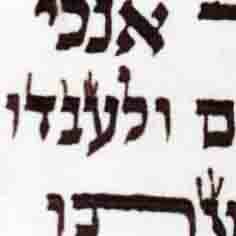 A. the Meiri explains, if a minimum even tiny letter [of the original, for example the hai] is left it is kosher. kmloi ois ktana means ois dida, the letter in question. B. the Mordehai explains "kmloi ois ktana" is a exact measure the size of a yud. kmloi ois ktana means a yud, the smallest letter. Accordingly, if the right foot is short, according to Meiri if the hai is still recognized it is kosher, regardless of exact measure [and if a doubt occurs, a tinok will determine. This in general fits with SA's shita explained above]. Now, if according to Mordehai and Rema the shiyur 'mloi ois ketana' is a yud. This forces that the yud itself has a shiyur!!! Otherwise we are playing with words – measuring something [the hai] with a broken ruler [a letter thas has no measure itself – the yud]!!! The minimal shiyur demanded according to Rema for a yud, is one kulmus in height, less than that is pasul. When I tell magihim/rabonim this, they all say: but it says in the poskim אין שיעור לעובי האותיות (there isnt a measure to the width of the letters)?? The answer is: the source of this rule is the Meiri (quoted in BY)! True, the acharonim (Shulhan Aruch Harav and MB … ) copy this meiri, but according to Rema we must limit this rule. I think there is a difference between the yud and the hai, the yud has 1 dimension, the guf of the yud is a dot נקודה, therefore according to Rema and Mordehai it is impossible to say in regard to a yud אין שיעור לעובי האותיות (there isnt a measure to the width of the letters). The same is in regard to the left foot of the hai, obviously the Rema isnt machshir מכשיר the left foot (regel smol) of a hai smaller than a ois ketana, because אין שיעור לעובי האותיות. A. according to Rema a yud that its guf isnt itself kmloi ois ktana = 1 full kulmus high [from top down] is pasul, regardless that it is pashut to the eyes of all, that this letter is a yud. B. there is a requirment of specific measure for the letters, lacking this measure is pasul. This p'sul is a pasul of 'shinui tzuras haois'. C. so, there is a machalokes between SA and Rema. According SA 'shinui tzuras haois' means that the letter is unreadable, the defining of what is readable = a shaylas tinok. According Rema, in addition to that requirement, there is a further requirement that letters must meet their minimum measure (a specific measure). Letters lacking their measure are not csiva tama and therefore pasul because of shinuy tzuras ois. Bezras hashem this will be continued – I hope there are some on the forum that benefit from what I'm writing. Rabbi Moshe Weiner writes: "I hope there are some on the forum that benefit from what I'm writing." 1) There are a lot of people reading this forum, growing in numbers every day(approx 300 hits per day). So far, (in less than a week) I see over 60 computers have been here to visit. Only 8 people are signed up to leave comments and posts, so clearly a lot more people are reading than commenting. Hopefully people will start to become more comfortable with posting and commenting as the forum contines to grow. I know R Moshe said this is out of the scope of the post, but I'm wondering if we can discuss it in comments. MB defines מלא אות קטנה as a yud + its regel, which is more than 1 kulmus. He bases this on beis yosef that says that a yud is not a yud without its regel. Conversly, other poskim as mentioned by R' Moshe define it as being 1 kulmus, which for example as brought by מקדש מעט in the name of baruch sheamar, is the length of the regel alone. MB on the Rema in 32:17 mentions that if one of the אותיות פשוטות are broken even if there is כמלא יו"ד it doesn't help because in any case it looks like a yud and is pasul. My understanding is, if MB holds that אות קטנה is yud + regel, then in 32:17 he must be measuring from the top of the rosh of the zayin or vav that is broken, because if he's just measuring the length of the remaining regel since it would be more than a kulmus, mistamah it wouldn't look like a yud (is would be sheilas tinok and not automatically pasul). Although if he is talking about the length of the remaining regel then the measurement אות קטנה makes sense to be the length of the regel of the yud alone (ie 1 kulmus), which contradicts MB's definition of rosh + regel. 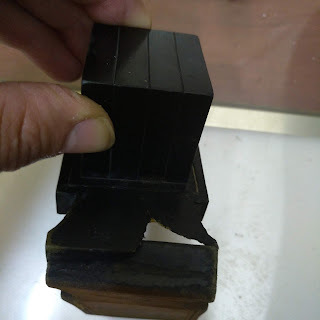 in regard to hai (especialy the inner foot) it seems that the measure is the foot alone, if so you are right why a vav that its foot is more than 1 kulmus should be a problem?